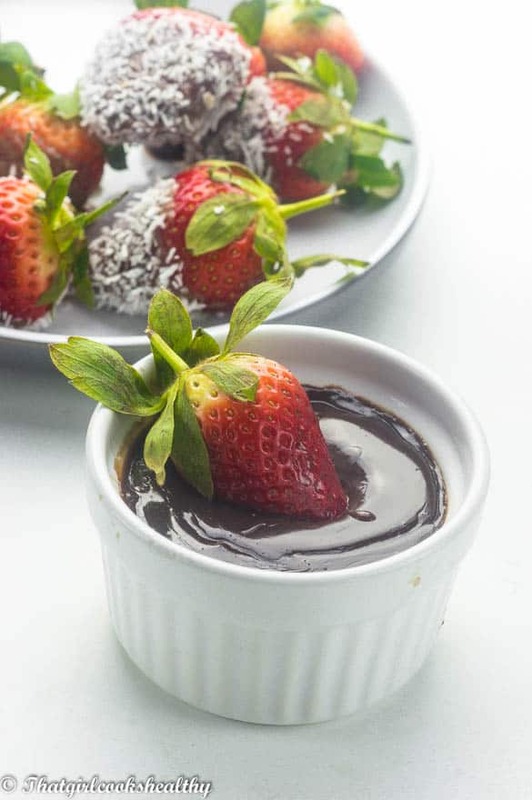 Chocolate covered strawberries – strawberries dipped in dairy free chocolate and rolled in shredded coconut would make the ultimate valentine’s day treat. Who doesn’t love a chocolate covered strawberries? Raise your hands! I know I do. Trust me you need this heavenly combination in your life. You don’t even have to wait until valentine’s day comes around to eat this decadent treat. If you’re one of those people who likes to celebrate February 14th, there are a number of things you can do to show your significant other just how much you mean to them. Some people feel that you should show your appreciation for your lover or spouse 365 days a year and not just save the lovely dovey stuff for one day in February. One the other hand, you have couples who like to heighten their expression of affection solely valentine’s day. I personally don’t think there’s a wrong or right answer to this because we are all unique and have our reasons as why we either celebrate February 14th or choose to simply treat it like another day. Whatever the case I doubt you’ll be able to resist these super sweet strawberries dipped in dairy free chocolate. I just had to go that extra mile by dipping a few of these babies in some shredded coconut. Again such a heavenly mix that one shouldn’t decline. 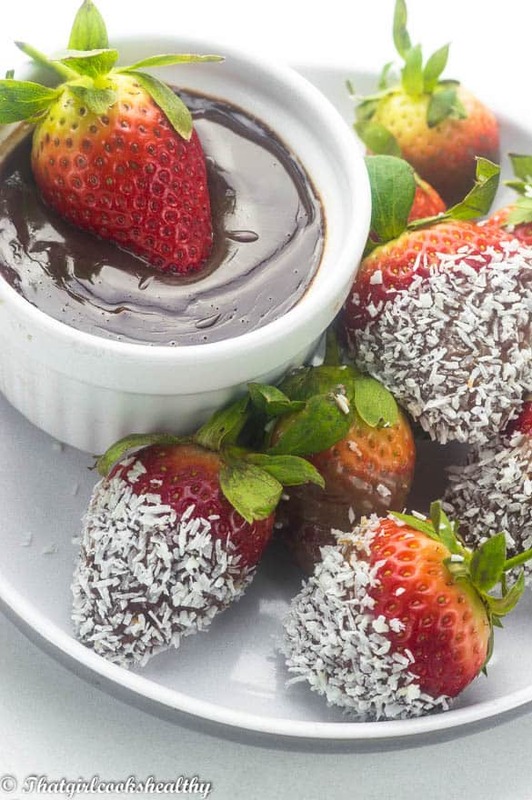 These strawberries dipped in chocolate are the perfect snack to nibble on this valentine’s. Why not make the day extra special by making them with your loved one. 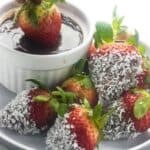 They are really easy to prepare, no cooking required at all – simply melt your favourite dairy free chocolate using a double boiler and get the coconut and strawberries (washed of course) at the ready. Don’t forget to wait until the melted chocolate is set before eating them. That’s all there is to it, no hidden extras, this is probably one of the simplest recipes you’ll be making with me and one that you will regard close to your heart….you can thank me later. 1lb of fresh strawberries, washed and dried. Line a baking sheet with parchment paper and spread the shredded coconut out on a plate. On medium heat, fill the bottom of a double boiler or saucepan with water (should be half way full) and simmer. Place the chocolate pieces in a heat proof bowl and set the bowl over the simmering water. Let the chocolate melt in it’s entirety, stir occasionally using a spatula to omit any lumps. Once the chocolate has melted, turn off the stove and remove the bowl of chocolate. 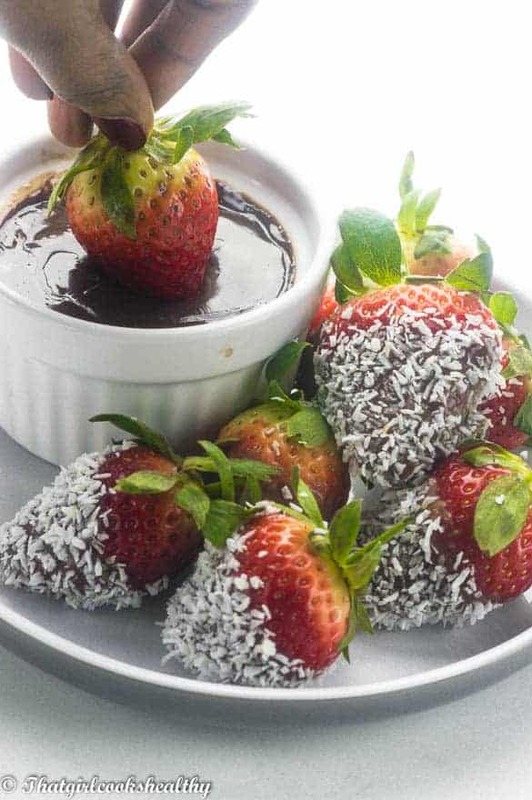 Hold the strawberry by the stem and dip into the chocolate sauce, swirl it around to ensure 3/4 of the strawberry is coated then roll the strawberry into the shredded coconut. Put the strawberry on the lined parchment paper ready to set. Repeat the previous set only rolling every second strawberry into the coconut. Let the chocolate set completely set before serving. Free feel to put them in the refrigerator to speed up the process. These look lovely and perfect for Valentine’s Day. I love the coconut on them, too. Strawberries are the best way to say “I love you” to someone you love. These berries looks juicy and fresh and perfect for dipping in chocolate. I know right! You cannot go wrong with strawberries dipped in chocolate. Who doesn’t like chocolate covered strawberries? The key is always waiting for the chocolate to set though! Yes, agreed! I’m guilty of trying to rush them prior to allowing the chocolate to set, you’re right! Oh my. The addition of coconut… GENIUS! This would make an incredible treat for Valentine’s Day! YES! Definitely, if you’re a coconut lover, you will love these little treats. Hey Charla, I made these over the weekend and they turned out great! Love the recipe! Thanks for the feedback Doug and so glad you liked the recipe too.